Excerpted from Wrecked (Moody, 2012). For the longest time, I avoided uncomfortable situations in life, especially the ones that involved the needy or hurting. All of that started to change a few years ago—when I started to notice people that had previously been invisible to me. It began in Spain and followed me to the streets of Nashville, where it continues today. The first time this happened, I was twenty years old. And the experience completely wrecked me—in the best way possible. Pain is the ultimate giver of perspective. It’s what shifts our paradigms, what disrupts our comfort, and what we tend to avoid the most. Ironically, this discomfort can set us free, if we let it. When we encounter the needs of a dying world, something breaks in us. We start to feel, maybe for the first time. And that’s where our best selves—our most compassionate motivations—thrive. But how do we break through the discomfort, the very thing we try to avoid? There is no easy way. When we encounter the needs of a dying world, something breaks in us. We start to feel, maybe for the first time. When I first experienced a world bigger than me, I was on a college study abroad program in Seville. Caught up in my own education and self-improvement, I mostly cared about learning Spanish and seeing all that the world had to offer. Little did I know how this semester overseas would shape me for the rest of my life. And it would have nothing to do with Spanish or travel. It was my junior year. I spent most days in class and most evenings hopping from one flamenco bar to the next. Adopting the distinctly Spanish-sounding name Pepe, I fully immersed myself in the culture. With a leather satchel from Florence, my black leather shoes from El Corte Ingles, and a growing lisp (which is native to the area), I was determined to blend into the sea of olive skin around me. By the end of each night, I had learned another Castilian phrase that I was eager to use in class the next day, usually mortifying my professors. That was a typical day-in-the-life of a wannabe Spaniard. One evening, though, the typical took an unexpected turn. On this particular night, as my friends and I were leaving the school and trying to figure out what we were going to do for the evening, we were interrupted by a whisper: “Pssst!” Standing in the middle of the street contemplating our plans for the evening, we didn’t notice it at first. Caught up in our excitement of exploring the city, we continued chatting. Would it be the same bar we had frequented the last few nights, or would dare to attend a discoteca? We started walking in the direction of the bridge that crossed the Guadalquivir River, which we traversed every day. The voice came again, forming actual words this time. “Hey you!” We stopped, turned around, and saw him emerge from the alley. The man was wearing a white shirt and brown pants, both covered in a sooty material. Rugged and gruff, he stood at least six feet tall. His dirty, cracked hands stroked a gray beard, stained yellow around his mouth. Holes had worn their way through his old dress pants, exposing his hairy knees, and his button-down shirt was scattered with stains. To cover it all, he wore a large brown jacket. It was obvious: this man was a vagrant. “Vagabundos,” my host mom called them. Not the type we should associate with, we had been told. It was obvious: this man was a vagrant. “Vagabundos,” my host mom called them. Not the type we should associate with, we had been told. He said something in broken Spanish, which caught our attention. Having turned around, we all stared at him, confused. He was too pasty to be Spanish, too cultured-looking to be American. No one said anything. We just gawked. Try as we might, we were unable to place the man; something didn’t fit. He spoke again in French, his voice beginning to crack. Then he commanded our attention with a harsh slur of words we didn’t recognize. What was that—German? Still, we said nothing. Finally, one of us broke the silence. “What’s the matter?” one of us asked. Lucretia was part Guatemalan and had been living in Seville for over a year now, making her practically a native in our eyes. Not to mention, she worked with the study abroad program, so it seemed natural to let her do the talking. The man said he needed money and asked if she would be willing to help. He said he had no place to go, no place to stay. Nowhere to lay his head. My friends and I looked at each other, uneasy. We had just come from a Bible study, where we had discussed how we were acclimating to a new culture and city. Most of us were from the suburbs or had grown up in rural farming communities, and the transition was a little jarring. This was the first time anything like this had ever happened to me. In northern Illinois, we didn’t have homeless people. At least, none that I recall seeing. But this was Seville—a city accustomed to passersby and vagrants and refugees. These kinds of things happened every day here. “I don’t know where I’ll be tomorrow,” he replied. Of course you don’t, I thought. You’re homeless. As soon as they left his lips, the words struck me hard. But I stood motionless, watching him. I felt paralyzed. What could I do? Lucretia played the diplomat well. She promised to return, but he wasn’t satisfied. He screamed after us as we walked away, saying things about God, about Jesus—anything to cause us to turn around. Even after we turned to cross the bridge, his words hung in my mind, plaguing me. But we kept walking, anyway. Attempting to drown out the man’s unrelenting cries, we distracted ourselves with idle conversation. I talked with my roommate about what he thought our host mom had prepared for supper. He replied, trying to fill the awkwardness we all felt, trying to silence our consciences. But all I could hear were the desperate pleas of a vagrant in need. By the time we were halfway across the bridge, my stomach was churning. There was a heaviness in my heart I couldn’t shake. The cries had now ceased, but I was starting to feel ill. And despite my best efforts to avoid the guilt, the man’s words continued to echo in my soul. I kept walking, each step getting heavier, a little more miserable than the last. Finally, I couldn’t take it anymore. I tossed my backpack at my roommate with an ambiguous explanation. “Just something I need to take care of,” I muttered. Then, I turned around. And ran. Racing across the bridge, I dodged men and women who were walking home from work. They glared at me, the white tourist bounding past them with determination. Each stride was longer than the last, and my heart beat quickly—I couldn’t get there soon enough. Arriving on the other side of the river, I searched the crowd. The man was nowhere to be found. I worried he had already moved on to another square, another audience who would ignore him. But then I saw him—crouched in the alley next to our school, smoking a cigarette. 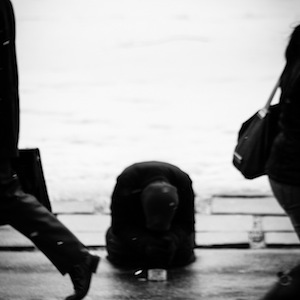 Because I had not been exposed to many, I had a general distrust of homeless people. I was afraid of them, didn’t trust them. So I was by no means about to fork over a bunch of cash to some European loudmouth. I was too smart for that, and maybe too cold. Still, I knew I had to do something. So I did what I knew how to do. “Don’t worry about it,” I said, smiling for the first time. I returned to the booth with a tray of food. I watched him quickly devour his meal, and neither of us said a word. After a long swig of beer, he asked my name, and I told him. “Micah,” he returned, slapping his chest like a caveman. He asked what I was doing here. I told him we were all students and the school where we studied was in the building he saw us leaving. Then I asked Micah’s story. He only told me bits and pieces, and I tried to connect them. He came to Seville from Germany but couldn’t return now. He had been kicked out of the country—for what, I couldn’t understand. He would’ve gone back, he told me, if it weren’t for one little issue: he had lost his papers. Without them, it was impossible to get home. So here he was, stuck in limbo, doomed to wander. Every night, Micah tried to scrape together enough change to eat a hot meal. Most nights, he was lucky—he’d find something in a dumpster or left on a park bench. A sandwich, a loaf of bread, an apple. But tonight was different. As Micah spoke, he got pieces of burger stuck in his ragged beard. Between chews, he would say something in broken English I could barely understand. We talked like this—back and forth—for about an hour. Just sharing our lives with each other: our interests, passions, and struggles. We listened and learned from each other, and as we did, we both became more human to one another. This was no longer the scary beggar, and I was no longer the heartless, selfish American from an hour before. I swallowed hard in disbelief. The only one? Really? And I had only showed up out of guilt. Surely, somebody else had stopped to help at some point… right? “Well,” I said, “I guess it’s what you said about not knowing if you’ll live until tomorrow and all that stuff about Jesus. That’s what He would have done, I think.” In retrospect, I should have been better prepared for this question. I should have rehearsed it ahead of time and been ready with an important theological retort. I felt I had failed my new friend. However, he seemed to think it was adequate, nodding and stuffing a handful of fries into his mouth. “I love God,” he said, his voice muffled by food. And I believed him. All the way home, I couldn’t stop smiling. I couldn’t recall the last time I had felt so alive, the last time I felt so free. I had passed people on the street before. I’m sure of it. And my usual response was to ignore them, to pretend I didn’t see. I thought this was wise, that I was showing discernment, but the truth was I was scared. For years, I was trapped by fear, paralyzed from doing the right thing. Stuck in a life that was more about me than others. That night, though, something changed. Something good and true was shaken loose, and I didn’t want to lose it. For years, I was trapped by fear, paralyzed from doing the right thing. Stuck in a life that was more about me than others. As I walked home, I thanked God for the opportunity I had almost missed, for the smile on my face I couldn’t wipe off. For the blood racing through my veins and the fact that Micah’s belly was full tonight. I never saw Micah again, even though I secretly hoped I would. I did wonder if he found a meal the next night. And the next night. And the one after that. I thought about him often, wondering how he was doing. After that night, I made a habit of asking my host mom for two sandwiches every time she packed my lunch—just in case. 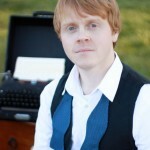 Jeff Goins, author of Wrecked, is a writer who lives just outside of Nashville, TN with his family. His next book, The In-Between, is about what we do with waiting and is due out August of 2013. You can visit him online at goinswriter.com.